Which is to say, a blogger I actually know via Twitter and blogging. I’m glad to say that Maureen loved BLACK DOG. “I loved Natividad and Alejandro and Miguel, and I found their story extremely compelling.” Good! That’s what I like to hear! That’s the first time someone has commented about that, and I’m happy to see this aspect of the world getting some appreciation, because I think it worked out pretty well. Which made me laugh! Moodily mood about! I am totally going to steal that phrase and use it forever to describe over-the-top angst. Plus, giveaway! You should click through, especially since the post above her review of BLACK DOG is worth reading. It’s about “books with all the feels.” Who else loves a book that makes you cry? 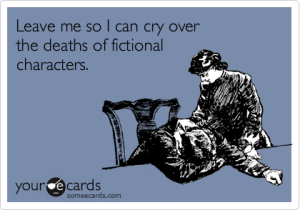 Which makes me try to think of the fictional character whose death made me cry, but right now all I can think of is books where a character’s death just tore up the protagonist, so I was really crying over the grief of fictional characters. Like THE SKY IS EVERYWHERE, an amazingly intense and wonderful book that is a great read even if you do need a whole box of kleenix to get through it. Puppy update: Boy 2 might be doing a little better; it’s hard to tell. I wish I could say he had definitely turned around, but no. I can and will tube feed him right up to weaning if I have to, and then we’ll see. The other two puppies are JUST FABULOUS. 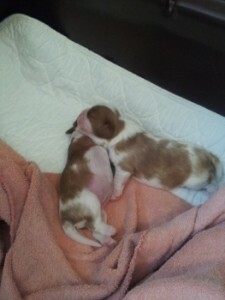 This is big Boy 1 trying to smother his sister in her infancy. He just tipped over a pound. If this was my H litter, I would be calling him Hippo. Which makes me try to think of the fictional character whose death made me cry, but right now all I can think of is books where a character’s death just tore up the protagonist, so I was really crying over the grief of fictional characters. Well, CRYOBURN, for me, although that is partly on Miles’s behalf. And BLACKOUT/ALL CLEAR for sure–dang it, Connie Willis! And Sidney Carton. And a few others I’m not thinking of at the moment, plus one I don’t want to spoil. But it’s true that often the grief of the other characters is what really hits hard.